HA! Now contrary to popular belief, and Pinterest, a “party” does not have to consist of anything HORRIBLY complicated like themed water bottle labels. Do NOT get me wrong, I throw crazy parties, I even have a party planning course, but I am a firm believer of being efficient with your time, doing what makes you happy, and NOT doing things for the sake of pictures. If making coordinating water bottle labels and straw signs makes you happy, you should do it! But you shouldn’t avoid having a party if you hate doing things like that! 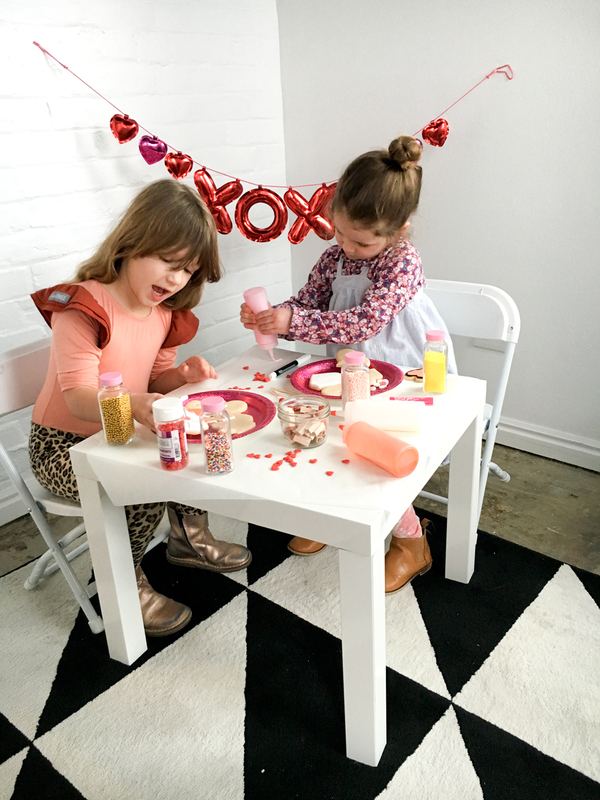 So this “party” that I’m sharing, is really just two TERRIBLY cute little girls, having a hell of a time decorating cookies. I love cookie supplies because they are cute in and of themselves, I put up a single bunting, from Target, and that was OUR PARTY! The problem with me as a blogger (or just one of them) is that I don’t like to do things until I’m REALLY doing them. 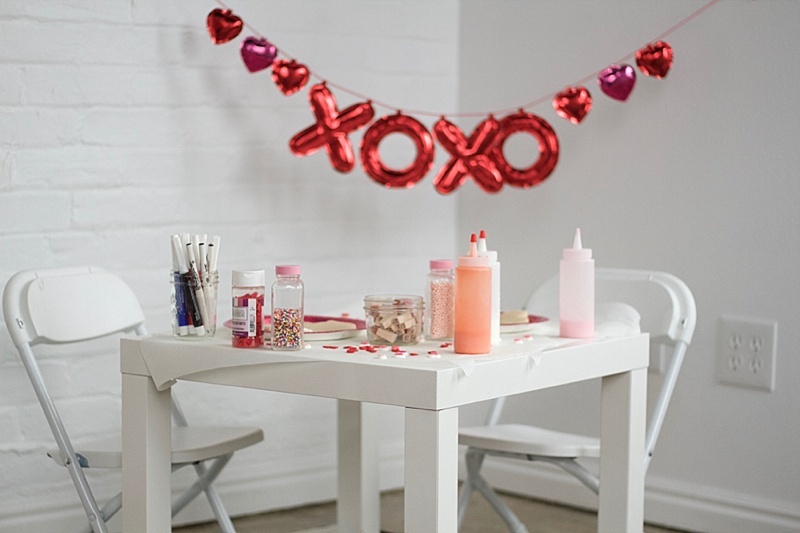 So even though this post for how to host a sugar cookie decorating party for kids might be a TAD bit late for you for THIS Valentine’s day (then again if you’re like me and decide to do things on the fly it’s not) it is still really useful information for any time of the year, any time you want to host a group of small humans to decorate sugar cookies with royal icing! On the other hand, it’s simple enough that you could decide to do it today, and have the whole thing ready before the big day o’ love! 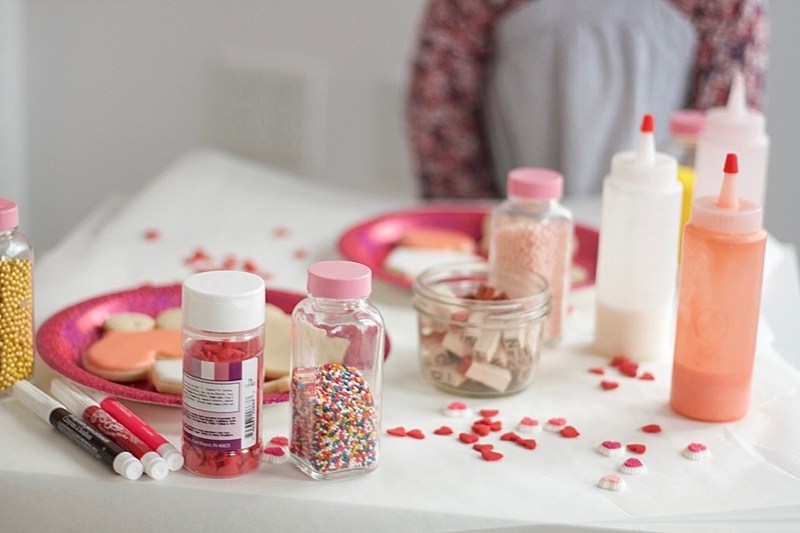 But whether you use these tips this weekend, or a year from now, I hope you find them helpful and that it makes doing a cookie decorating party for kids a whole lot easier for you! Buttercream frosting is ALSO awesome for decorating sugar cookies, and I have a really good recipe for that RIGHT HERE: Perfect Easy Buttercream Frosting. Most of the tips I talk about in this video though still apply for hosting a party with kids, so I mean, you can still watch it even if you’re planning on using buttercream. BUT I like using royal icing because there are just a lot more decorating techniques, and the kids feel pretty cool doing them, and get really into it. Remember, I cover how to make the PERFECT sugar cookies and royal icing in my online course: Alison’s Cookie Party. So if you want my recipes, that’s where they are! But other people have them too, ha so you’re not SOL. 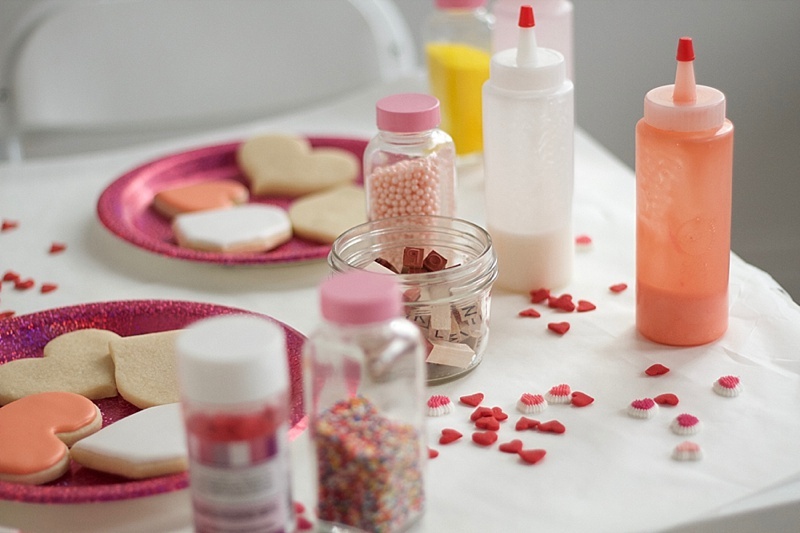 Be sure to watch these videos: How to use edible glitter and make sugar cookie necklaces and also How to use edible spray paint and stamp on sugar cookies, because all of these techniques will be fun to implement at your sugar cookie decorating soiree! Again I hope these are some easy, but helpful ideas! I always try to make it really clear that I don’t decorate the cookies that I show for work WITH my kids! I like to make it fun by keeping it an activity just for them! Again, I have my online course Party With Alison: A step-by-step guide for throwing any type of SUPER fun party! So if you’re looking to not be overwhelmed the next time you need to host any sort of gathering, I highly recommend it. Ha. Otherwise I wouldn’t have made it! Do you love your children enough to do this for them? HAHAHA Kidding, you still love them even if all you do is turn on Netflix and hide in the bathroom. Or at least that’s what I tell myself!